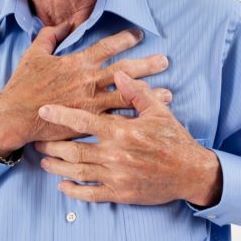 Causes of chest pain can vary from minor problems, such as indigestion or stress, to serious medical emergencies, such as a heart attack or pulmonary embolism. The specific cause of chest pain can be difficult to interpret. Finding the cause of your chest pain can be challenging, especially if you've never had prior symptoms. Even doctors may have a difficult time deciding if chest pain is a sign of a heart attack or something less serious, such as indigestion. If you have unexplained chest pain lasting more than a few minutes, it is better to seek emergency medical assistance than to try and diagnose the cause yourself. As with other sudden, unexplained pains, chest pain may be a signal for you to get medical help. Use the following information to help determine whether your chest pain is a medical emergency. Unstable angina — sudden, new chest pain, or a change in the pattern of previously stable angina, that may signal an impending heart attack. The severity, duration and type of angina can vary. If you have new or changing chest pain, these new or different symptoms may signal a more dangerous form of angina (unstable angina) or a heart attack. If your angina gets worse or changes, seek medical attention immediately. Pulmonary embolism occurs when a clot — usually from the veins of your leg or pelvis — lodges in a pulmonary artery of your lung. The lung tissue served by the artery doesn't get enough blood flow, causing tissue death. This makes it more difficult for your lungs to provide oxygen to the rest of your body.